New Zealand, along with a number of other Commonwealth countries, issued stamps to mark Commonwealth Day in 1983. Consisting of four denominations, the issue reflects New Zealand's cultural, geographic and economic diversity. 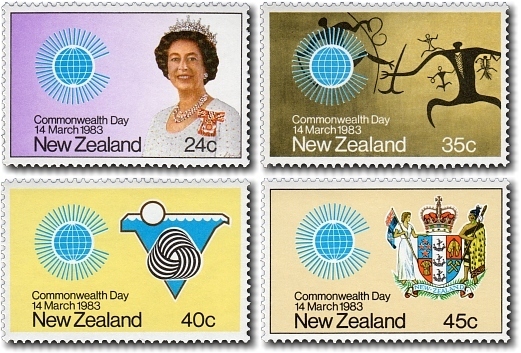 Each stamp features the Commonwealth symbol. 24c - Portrait of Queen Elizabeth II. This stamp depicted a portrait of Her Majesty, Queen Elizabeth II wearing the Sovereign's Badge of The Queen's Service Order. 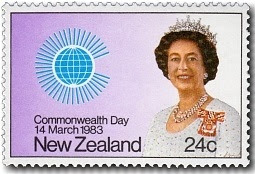 The Order is distinctive to New Zealand and was introduced by Her Majesty in 1975. 35c - Maori Rock Drawing. This example of early Maori art was found at Dog's Head Rock Cave on the Tengawai River, South Canterbury. Using charcoal, early Maori artists drew these figures on the limestone walls of the cave. A feature of these figures is their three-fingered and three-toed limbs. 40c - Woolmark / Wool Scouring Bowl. This design shows the distinctive woolmark superimposed on a stylised representation of a "mini-bowl". These bowls are a New Zealand invention used for scouring (washing) greasy wool. The level of technology in wool scouring in New Zealand is acknowledged to be the highest in the world. 45c - New Zealand Coat of Arms. One quarter of the shield depicts four stars as representative of the Southern Cross while another quarter displays a fleece representing the farming industry. The wheat sheaf in the third quarter represented the agricultural industry, whilst the crossed hammers in the fourth represented the mining industry. 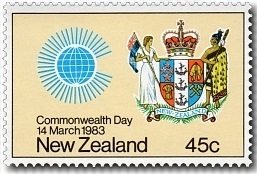 The three ships in the centre of the shield symbolised the importance of New Zealand's sea trade. 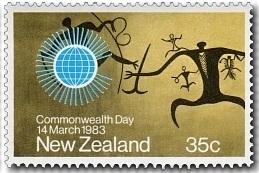 The supporters on either side of the shield consisted of a Maori chieftain holding a taiaha (a weapon) and a European woman holding the New Zealand ensign. Surmounting the Arms is the St Edward's Crown which was used in the Coronation ceremony of Her Majesty, Queen Elizabeth II. 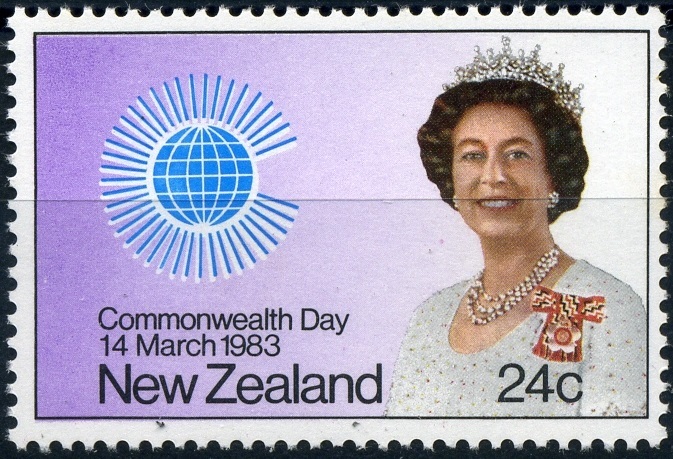 The crown symbolised the fact that Her Majesty is Queen of New Zealand. 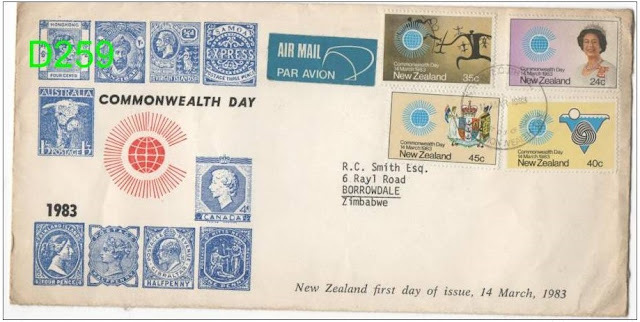 1983 Commonwealth Day FDC (mint). Commonwealth Day FDC with commonwealth stamps. around the rays of the globe. 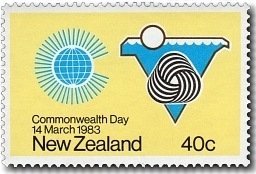 1983 40c Commonwealth Day, plate 1A with a block of 10 stamps. The yellow colour faded out left to right, dark yellow to light yellow. Just a note to unknown person leaving comments here - any comments that contains advertising or a link to another web site without our consent will be blocked and deleted. 2017 Native New Zealand Freshwater Fish. 2000 Ross Dependency Transport on Ice. Personal Message & Greeting Stamps.